The present composition is known in more than one version. Dr. Alain Roy (Gérard de Lairesse, 1992, p. 496, under no. P.R. 15) lists three versions: the first, on canvas, 50 x 62 cm, is in the Musée des Beaux-Arts, Dijon, the second, on canvas, 55.2 x 68.5 cm, was offered for sale, Christie's, New York, 15 May 1996, lot 34, and the third was offered for sale, Hôtel Drouot, Paris, 5 March 1986, lot 155. Dr. Roy rejects De Lairesse's authorship for the above versions, suggesting an alternative attribution to Ottmar Elliger II. 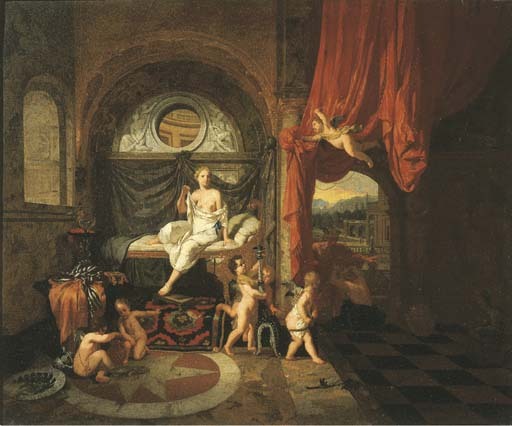 The subject is taken from Ovid's Metamorphoses, II: vv. 708-832, which relates how Mercury, having fallen in love with Herse, enters her room and turned Aglauros, Herse's jealous sister, to stone with a touch of his wand.